Best known in his own world and time as William, 9th Duke of Aquitaine & 7th Count of Poitou, and one of the most powerful people in Europe. Known to scholars of histories and stories as an exemplary case of mythopoesis and mythification; better known in Occitanist circles as The First Known Named Troubadour. 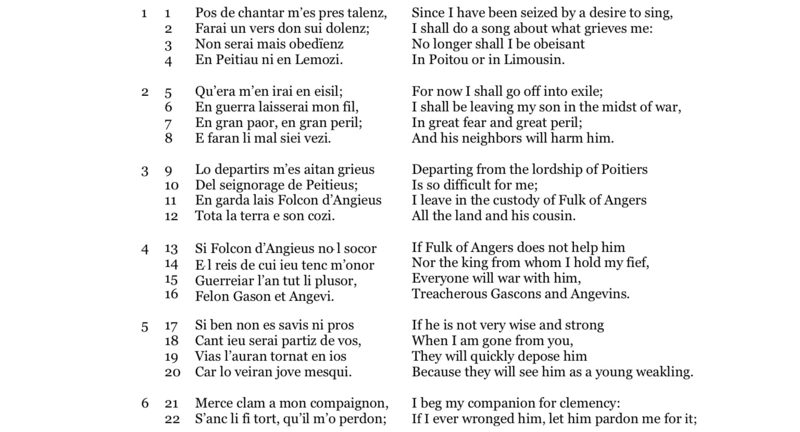 Best known to Yours Truly as the reason I changed my doctoral work from its original field, late-15th to early-16th century Grand rhétoriqueur poetry and poetics, within which virtuoso punning. 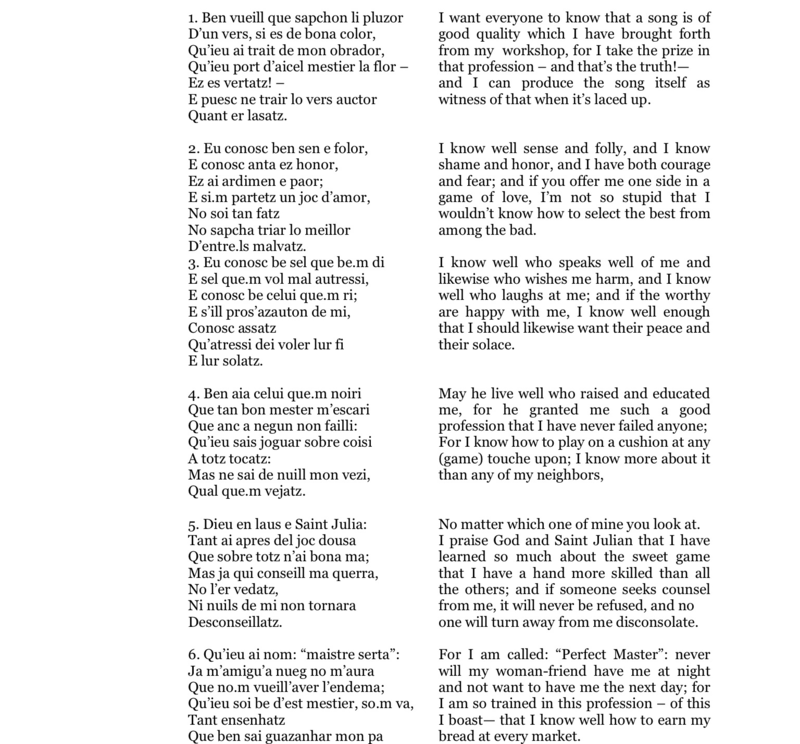 Early in my first term, back in giddy 2000, I read three poems by Guilhem. (Such things always happen in threes.) 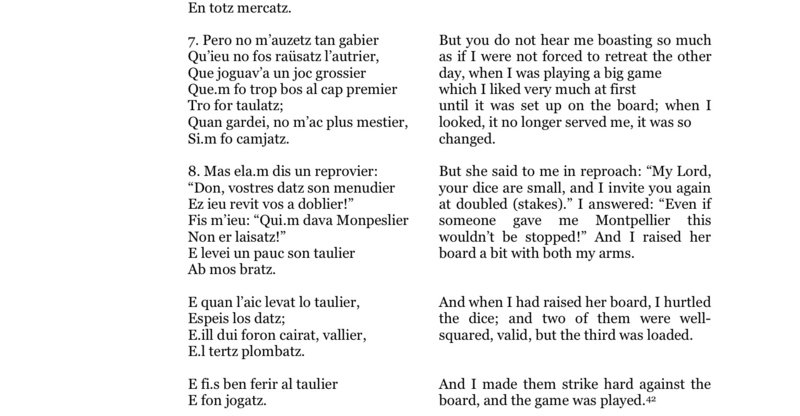 This was my first encounter with Old Occitan. It was love at first sight. Ladies and gentlemen, bona gent: I fell for him. What hope could an Old Occitanist virgin have? Guilhem’s powers of seduction have that potent a draw, nearly a thousand years later. This was also my first experience of medievalism, that magical mystical dissolution of the veil between worlds, of being in the moment of flow between them, of fluid taphonomic seepage. No, this was not a crude matter of hymenal breaches; Guilhem has too sensitive a touch, this bel amics is in a different class of talen and talent, the perfect bon fin’ aman. And a poet not for little girls and other sweet fresh young things, but for (and of, and about) grown-up women and other adults. Here, then, are the three poems that Did For Me. As it were.